In recent years, centers all over Italy have been shut for fraud or misuse of public money, exposing insufficient government oversight and often blatant corruption. In the Rome-based Mafia Capitale investigation, managers at a company that secured lucrative public bids to provide services for reception centers are currently standing trial. 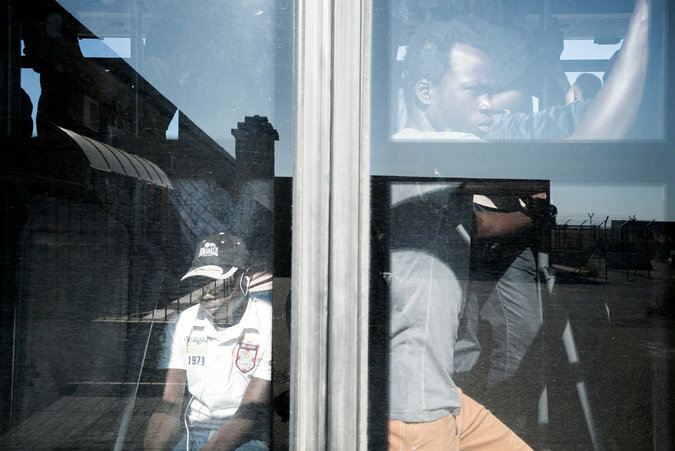 Migrants on a bus taking them from the Sant’Anna Cara center to the city of Crotone, in Calabria. “Mobsters are where power and money are,” said Nicola Gratteri, one of Italy’s more active anti-mafia investigators. He is the chief prosecutor in Catanzaro, in Calabria, home to one of Italy’s most powerful mafia groups, the ’Ndrangheta (pronounced n-DRAHN-ghe-ta). The central government in Rome, as well as the European Union, provided the reception center in Calabria with roughly €30 a day for each of the migrants housed in a former NATO base surrounded by razor wire. The money was supposed to go toward food, housing, personal items, and even social workers and Italian teachers to help the migrants integrate and learn the language. Instead, using hundreds of hours of hidden camera recordings and reams of administrative documents, investigators say, they found that the center’s catering service did not provide decent food to migrants, or even enough, while invoicing the Interior Ministry for thousands of meals every day. Waiters in the cafeteria were recorded on videos raising their hands in a shrug to indicate that the food had run out, while dozens were still awaiting their meal. Migrants did not receive a daily allowance of €2.50 in pocket money, but a card that could be used only at the vending machines inside the center, allowing mob associates to profit. A sanctuary at Isola di Capo Rizzuto. The center also vastly inflated the number of migrants it was caring for, milking the government for still more money than it was due, the investigators say. Rather than provide aid to the migrants — many of them from central Africa, Pakistan and Bangladesh — much of the money went to fund a host of projects, either for the amusement of the mobsters and their business associates, or to allow them to profit still further. The enterprises included a sumptuous movie theater, still under construction; a new sports field; and travel agencies and boat rentals so tourists could explore the turquoise waters of the Capo Rizzuto’s marine reservoir. A portion of the money went directly to fund the local ’Ndrangheta, a family-run mafia association that is Europe’s primary importer of cocaine, with tentacles all over the globe. One benefit of the cash flow, the local authorities and residents say, was that it at least provided enough money for all the notoriously violent and reckless ’Ndrangheta families in the area, calming the competition and bloodshed among them. Magistrates noted that the internecine war had stopped in the early 2000s, after the charity took over the reception center in Isola di Capo Rizzuto, a town of 15,000 in one of Europe’s poorest regions. The last violent episode happened in 2004 on a dusty road, bordered by the wind turbines that mobsters operated, leading from the town to one of its pristine beaches, when rival mobsters annihilated the most prominent member of the resident family, Carmine Arena. 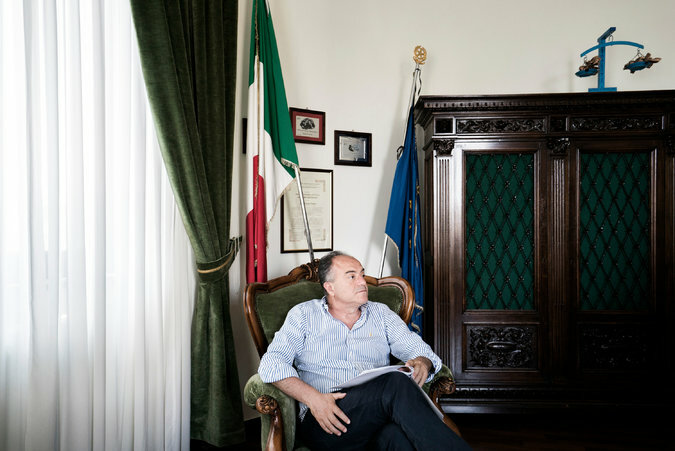 Nicola Gratteri, one of Italy’s more active anti-mafia investigators and the chief prosecutor in Catanzaro. “Mobsters are where power and money are,” he said. A hail of machine gun bullets devastated the armored Lancia car in which he was leaving his home, a villa hidden behind a high wall and an iron gate. In fact, the ’Ndrangheta uses violence only to defend its business or territory, and it flourishes when it has consensus, he said. In Isola di Capo Rizzuto, the charity involved in the scandal was the local independent branch of Misericordia, run by Father Scordio. The nationwide charity does nonprofit social work — like operating ambulances and civil protection services — through public bids or donations, and with the help of volunteers. Prosecutors have found no connection between the national charity and the local scandal. The Misericordia of Isola di Capo Rizzuto, unusual in size, provides over 300 jobs. The local charity’s managers have been suspended, and the association has been put under judicial administration, though it still runs the center. “In Isola, everyone works or knows someone who works for them, so people prefer not to take sides,” said Antonio Tata, the local representative for Libera, the anti-mafia association also founded by a priest, the Rev. Luigi Ciotti. 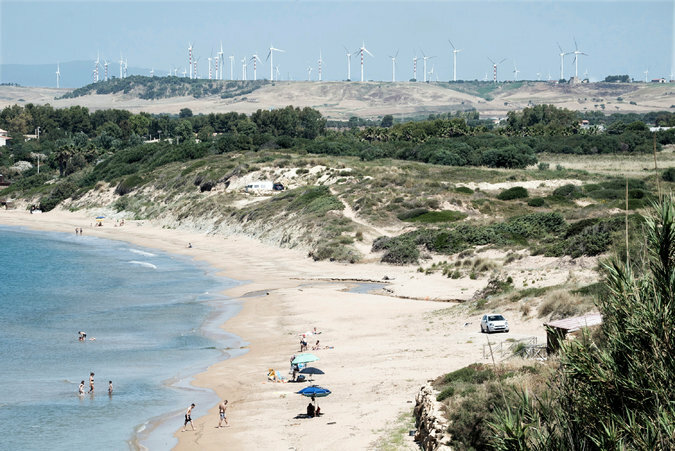 Mobsters operated wind turbines in Isola di Capo Rizzuto. Mr. Tata explained that a few years ago, Father Scordio, in a public sermon, had spoken of an “invasion” when Libera took part in a public bid to work about 250 acres of olive groves, wheat and barley fields confiscated from the Arena family after members were convicted of mob association. Father Scordio seemingly disliked the presence of the anti-mafia association in his area. But other residents said it seemed clear to all that the charity and the mobsters were in business together. A resident who has lived in Isola di Capo Rizzuto for 40 years said people in the town suspected something was wrong, with the migrants protesting in the streets about their squalid living conditions despite the millions of euros in government aid. The resident declined to give a name for safety reasons. The migrants fleeing poverty and violence in their home countries find themselves struggling here. The migrants try to find work, but it is not easy to do so. “I am walking for kilometers at sunset to find work in the fields to make some money,” said a man named Sunday, 25, from Nigeria, who worked in Libya for almost a year.